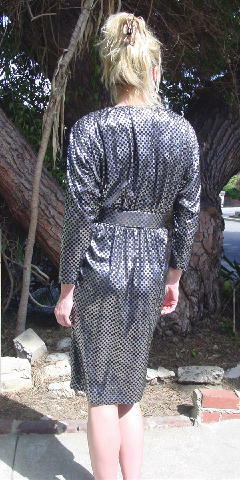 This 100% polyester vintage dress is by Taurus II and was made in the USA. The fabric has some body to it. It has a 10" V neckline and gathering along the shoulder seams. There is an elastic waist and an inverted V front bottom with an 8" long opening and rounded edges. It has a black background with a silver metallic dot pattern of square shapes. There is a fabric covered belt and buckle. The tag says 9/10, but it fits like a size 6. It's from a former actress. She wore it once, to a Hollywood party. 1st hole 30 3/8", last hole 27 3/4"